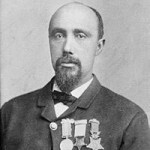 March 1, 1843 Robert A. Pinn, Medal of Honor recipient, was born in Stark County, Ohio. Pinn joined the Union Army during the Civil War and by September 29, 1864 was serving as a first sergeant in Company I of the 5th U. S. Colored Infantry Regiment. On that day, his unit participated in the Battle of Chaffin’s Farm in Virginia and it was for his actions during the battle that he was awarded the medal, America’s highest military decoration, on April 6, 1865. His citation reads, “Took command of his company after all the officers had been killed or wounded and gallantly led it in battle.” After the war, Pinn graduated from Oberlin College and became a high school teacher and principal. He also read for the law and was admitted to the Ohio bar in 1879, the first black lawyer in Massillon County. Pinn died January 5, 1911. In 1973, the Ohio National Guard named its new armory in his honor, the first armory to be named after a black soldier in Ohio, and in 1998 the shooting facility at the University of Akron was renamed the Robert A. Pinn Shooting Range.